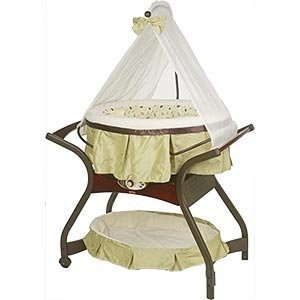 The The Fisher-Price Zen Collection Gliding Bassinet is very nice, but I don’t think it is ideal for my situation. I probably would not use this type of bassinet again. I am very happy that I got this at 1/3 of the regular price or otherwise I would be very unhappy with this purchase because it is not as functional as I had hoped. things so that there is a constant sound to help her stay to sleep. I find the music to be a little annoying. I also don’t like that sounds seem to shut off rather quickly. It is usually pretty easy to reach over and press the button again, but I think it would be better if lasted just a little longer to ensure that she is in a deep sleep. need to take it off, but it would be nice to be able to wash it. Finally the shelf/basket at the bottom of the bassinet is lined with fabric and has a ruffle edge. This rarely stays where it should and ends up looking rather messy. Perhaps if you kept this area very organized with boxes or baskets it would look better, but mine always seems to look disheveled. know if wakes her up further but it certainly wakes me up. I sometimes wonder if she would go back to sleep on her own if she was in something that didn’t produce this clank/ thump with every movement. Finally this bassinet is just a little to tall for me. I’m using it right beside my bed and wanted to be able to reach in and pick up my baby at night to nurse. I now realize that something a little shorter would have made this much easier. Although I have a fairly tall bed, I have to sit completely up and scoot down in the bed to be able to reach up and into the bassinet and pick her up.